The Secret Hair Salon enjoys a reputation in Dunleer, County Louth for great styling, friendly customer care and affordable pricing. 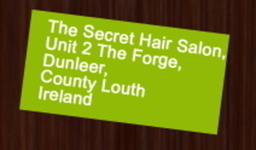 Since launching four years ago we have become known as one of Dunleer's most popular ladies and gentleman's hairdressers. please ring: 041 686 3510, or come in and meet us!